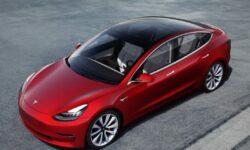 One of the major events in the European car industry during 2018 was the drop in popularity of diesel. Starting with the dieselgate issue in September 2015, this then worsened when local authorities around Europe sent out unusual messages about possible bans. All of this generated chaos among consumers, who became unsure of the benefits of what was formerly the most popular fuel type in Europe. Uncertainty among consumers as a result of unclear messages from governments is the most straightforward explanation for diesel’s decline. If 2017’s diesel drop was considered extreme, then last year’s decline could be described as a freefall and in fact only got worse. With a 36% market share, diesel car registrations posted the lowest result since 2001, when they were taking off as a valid alternative to gasoline cars. In only three years, diesel’s situation changed from being the most popular fuel type (51% in 2015) to regressing back to the same levels of 17 years ago. The fall is even more dramatic when comparing last year’s market share to the registered peak of 2011, when diesel cars counted for 55% of total registrations in Europe. The situation is also stark in terms of volume. 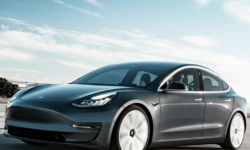 Registrations of diesel cars totalled 5.59 million units in 2018, marking the lowest result since 2001 when consumers bought 5.44 million cars. Fears among consumers undoubtedly affected registrations, which fell by 18% compared to 2017. This was 10 points more than the drop recorded in 2017 when diesel registrations fell by 8% compared to 2016 – instead of improving, the situation is getting worse. However, it wasn’t bad news across the board. Diesel cars continued to rule in three European countries: Ireland, Portugal and Italy. Despite the double-digit falls registered in those markets, diesel registrations counted for more than 50% of the total. Nevertheless, they lost ground compared to 2017, with their market share falling by 10.7 points in Ireland, 7.8 points in Portugal and 5.1 in Italy. In 2017, diesel dominated in six countries. One major milestone last year was that France outsold the UK as the third largest diesel market in Europe, behind Germany and Italy. Demand was severely affected in the UK following unclear announcements about possible bans and Brexit uncertainty. 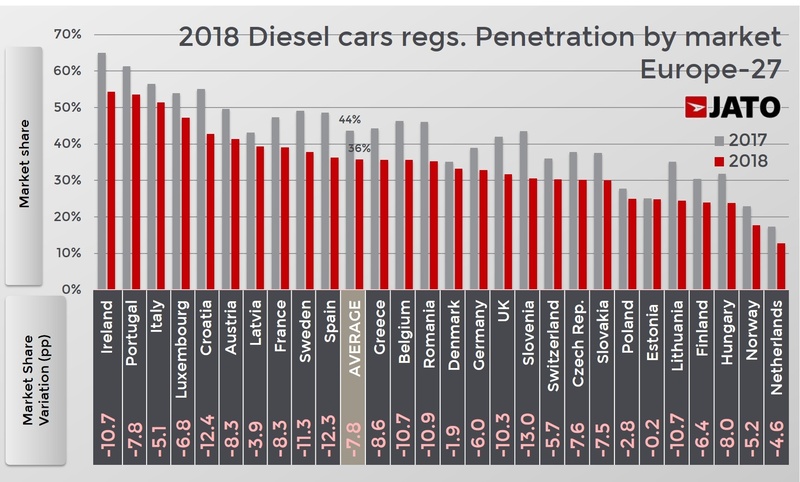 In fact, the UK registered the lowest diesel penetration among the big 5 markets, with 32% – the lowest level since 2004. Diesel has also managed to hold on to its position at the top of the premium brands. Despite the turmoil, it is still the most preferred fuel type for consumers buying Audi, Mercedes, BMW, Volvo and many others. Among the top 10 brands with the highest diesel penetration, 8 of them were premium brands, and diesel counted for more than half of their registrations. In terms of registrations volume, Mercedes and BMW were the second and fourth largest last year. 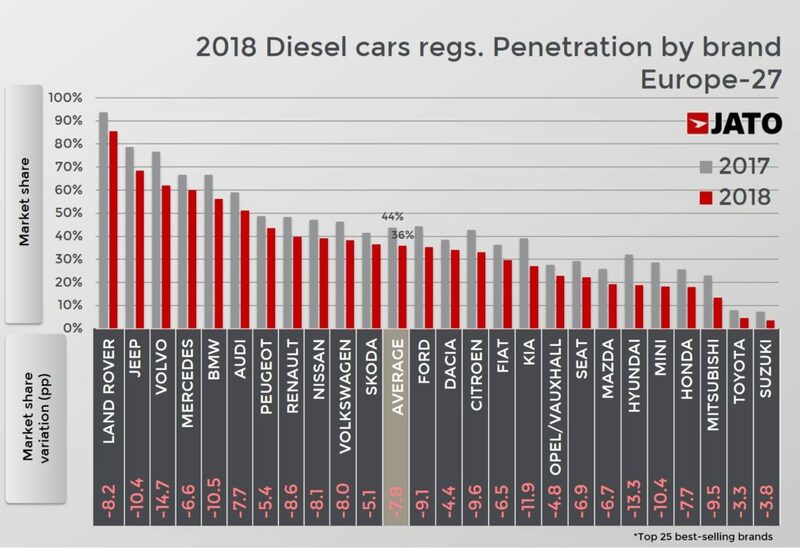 However, among the 83 brands that recorded a change between 2017 and 2018, only three recorded an increase of diesel penetration within their sales. DS brand saw the largest increase, as the diesel volume jumped from 44% to 49%. , but most brands saw a negative change. The most dramatic case was Porsche, which decided to drop some diesel versions and concentrate its efforts on developing AFV. As electrification takes off, it is clear which brands are moving faster: diesel is very much a small part of the sales of Subaru, Hyundai, Mini, Suzuki, Toyota, Porsche and Mitsubishi. The results last year confirmed that the “diesel panic” is real. After the big drop registered in 2017, the market continued to fall and even accelerated the trend. Although the fall is expected to continue in 2019, it will most likely be at a more moderate rate. And unlike the changes we’ve seen to date, the continuing downward trend won’t be associated with the diesel crisis and negative propaganda, but with the rise of hybrid and electric cars. This offer is rapidly growing, and the cars available are definitely more appealing, and trendy. Meanwhile, gasoline cars are slowly becoming the only alternative to those who don’t trust the AFV technology yet.